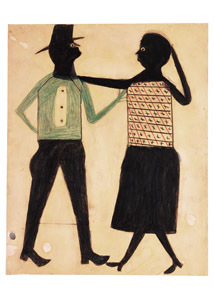 While the High Museum's blockbuster MOMA exhibit Picasso to Wharhol is winding down, this spring still offers the chance to enjoy the work of an altogether different master of modern art, Bill Traylor. Born into slavery in 1854, Traylor settled in Montgomery, Alabama is his later years, eventually supporting himself by selling painting and drawings produced on cardboard he found on the street. Traylor's work is full of childhood remembrances and plantation life, street scenes around Montgomery and captured moments of observation. The 60 works on display in the bottom level of the museum (take the stairs behind the main gift shop to avoid the crowds) are culled from the High's own substantial collection and the holdings of the Montgomery Museum of Fine Art. Traylor is venerated as one of the grand masters of the American Folk Art movement, and like the work of Howard Finster, his images are simultaneously accessible and profound. This is a show for kids and connoisseurs alike. Head to the High before the exhibit closes on May 5. This promo for Bill Traylor: Chasing Ghosts, an upcoming documentary about Taylor's life, is a great preview of many of the works you will enjoy.